I gave this movie a one star rating when I was first writing everything out for this blog. I hadn’t seen the movie in about 7 or 8 years when I gave it that rating. I just recently viewed the movie again in order to give it a proper review and I whole heartedly stand by my one star rating. The whole idea of the film was actually very intelligent and interesting. Basically the turned the cameras around on what was going on in the first film. This movie follows a group of student filmmakers, Amy (our final girl) is the little genius who comes up with an idea of a serial killer who kills on his victims based on urban legends (well actually it was Loretta Devine, reprising her role of Reese from the first film, but she was simply talking about the events of the first film). That’s an interesting idea, what followed after that was the sad attempt to make this a good movie, and the abortion of the result. When you make a movie about someone killing people based on urban legends, it’s probably a good idea to have the killings be based on urban legends. The first film did this very well, this time around it seems like the writers forgot it was a movie about urban legends and just starting killing people off randomly. 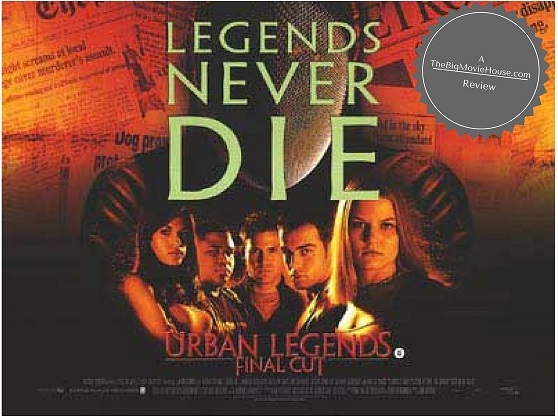 The first person to die in the movie was killed in a urban legend scenario. The classic, waking up in a tub full of ice and your kidney is gone. That’s not how she is killed, but at least it has to do with an urban legend. Every other death that follows was just random slasher film killings. One girl is attacked and has her neck cut out, a man is killed when beaten with a camera lens. None of these are or will ever be urban legends. Then comes the stupid stuff in the movie. When the girl wakes up in the ice bath and calls 911 on her cell phone, she says “I just woke up in a tub of ice”, as the 911 operator replies “And let me guess, your kidney is missing? I have Princess Di on the other line” and quickly hangs up on her. This is the director’s / writer’s / producer’s sad attempt at humor in a horror movie, something Scream had accomplished so well 4 years prior. I really don’t think a 911 operator would just cut someone off like that if that call had actually happened. Also, what’s with the Princess Diana joke? That joke makes no sense, are they trying to attempt a rumor that she is still alive? I don’t ever remember hearing that she might still be alive, like everyone thinks Elvis Presley is still alive. And this joke feels slightly in bad taste, seeing how Princess Diana had died only 3 years before this movie came out. Another dumb thing that happens in the movie is a character (who plays a bad actress, or is she even acting?) forgets her keys when leaving the set and she is all alone. First off, why is the lead actress the last one to be leaving the studio? So she heads back to the studio, looking in drawers and desks on the set. Why would she have put her keys anywhere on the set? She then goes into the bathroom, where everything is set up for a dog to be hanging from the shower. She immediately begins to look through the fake guts on the floor. WHY? Why would anyone put their car keys into the bloody fake guts on the floor of the set? And what do you know, the keys are in the guts! It’s these reasons why the slasher film has pretty much died down again. Scream kick started the slasher genre again in 1996, but as it happened in the 1980s it happened again in the 1990s and beyond, half hearted sequels that come out almost immediately just to cash in on the original. Had they spent more time on this film, and actually worked out the kinks this could have been a great sequel.